What a single data center looks like. Webheads - This tier hosts processes that handle request routing, serving of static responses, API requests that are read-only, and our verifier service. Keysigners - This tier is accessible only via webheads and is responsible for certificate generation - creating cryptographic material that asserts for a short time a user's ownership of an email address. BigTent - This tier is web facing and handles Identity Bridging which is a technique that allows us to let users of popular email providers sign in without checking their email. DBwriters - Hosts the process that handles API requests which require writing to the database, and is only accessible via the webhead tier. Database - The database tier is a multi-slave single master MySQL deployment that Webheads and DBwriters communicate with. Proxy - Squid forward proxies allow all tiers that must perform outbound HTTP requests to access the internet - Serves to cache responses as appropriate and allow us to restrict allowed outbound traffic from a deployment. The write master is replicated into multiple machines in both data centers. At present during normal operation we use DynECT, a managed DNS provider, to split traffic between two colocation facilities using DNS load balancing. What this means is that a 30 second TTL response to DNS queries is sent and routes traffic to one of the two facilities. Non-Fatal system failure inside a colo: All of the tiers listed above have an IP load balancer that is constantly checking for system health. If any node in these tiers fails, then health checks fail, and the system is removed from rotation. Our operational team is paged, and they get to repairing the problem. Fatal colocation facility failure: This includes hardware failure that affects a critical, non-redundant piece of infrastructure inside a colo. This could be a load balancer, it could be the database write master, or a number of other things. The response here is to disable the entire data center in DNS, and repair the problem. Much like the IP load balancers, DynECT uses health checks to automatically stop sending traffic to a given DC in this scenario. If the downed DC hosts the current write master, we have a manual procedure to promote a new master in the remaining DC and restore service. Two requirements make this procedure work. First, we never make a database change that isn't backwards compatible. If this means phasing features over several updates, this is what we do. This requirement allows us to always have a rollback option (updating the service twice a month for two years now, we've rolled back half a dozen times). Second, we assume that frontend HTML code always interacts with a backend of the same version. This allows us to not worry (for the most part) about version compatibility in our (internal) API, which accelerates development. This second requirement will have to change on the road to higher availability. Not sufficiently geographically distributed - we'd like to land data centers on every continent to reduce latencies. Insufficient redundancy - We'd like to be in multiple DC's at all times - allowing a disaster which affects multiple colos to be handled gracefully. Disaster can imply downtime - Even though the promotion of a new master is a fast process, we'd like to be able to be able to loose multiple DC's simultaneously with zero user facing downtime. Constant inter-data-center communicaiton required - If inter-data-center communication is lost writes in the distant datacenter fail. No rolling updates - At scale, it behooves us to be able to partially roll out an update. This is important to be able to mitigate user impact when bugs are introduced, and to be able to function well under heavy constant load. The key differences here are we'll be running in many more data centers, and we'll be leveraging auto-scaling to be able to handle arbitrary load. We'll still split traffic using DNS mechanisms, but we'll add geographic intelligence to our DNS routing. The only inter-datacenter communication will still be the one and only database. We are fighting hard to introduce no new systems that bring additional communication requirements. When disaster strikes, the affected data centers will still be automatically removed from DNS while we diagnose and repair. Because we'll have greater coverage and because simply removing a DC from rotation is a simple and fast process which reduces user impact, we'll be able to eliminate user impact faster, and there will be less time pressure on resolution. To achieve this scale, we'll change our deployment procedure. It is no longer viable to expect that we can switch traffic in a single sweep, and we need the benefits of rolling updates. Let's spend a moment digging into the technical challenges that face us as we make this transition . Persona has a trivial database schema. Server persistence requirements are tiny given careful architectural decisions we've made along the way, our commitment to privacy (we store the minimal possible amount), and the design of the protocol. This is excellent as it makes the database challenge tractable. We must leverage these properties and move away from a single-master setup. There are plenty of available distributed data stores that ensure eventual consistency - which could fit extremely well in Persona. When you also consider that given the way the service is built, there are fairly easy data synchronization requirements, we have a lot of ways to solve this problem. To set a concrete goal, we need to move to a database setup that runs well distributed in ten different geographic locations and can continue to run if half of those locations abruptly go away. To support Even Higher Availability, we must ensure that version N of the service interoperate with version N-1. This means that we must phase changes to our internal API so that we deploy features which require a new internal API in two deployments. This will allow us to incrementally deploy service updates. We have tools to visualize service health in our our current production deployment that are pretty good. We have a unified view of our two data centers and use statsd and other monitoring tools to keep tabs on our service. Our ability to spelunk log messages is somewhat limited and can require logging into to multiple production machines. These need to drastically improve. We need reliable mechanisms for understanding global system health (all data centers), and we need better tools for isolating root cause of issues within a single data center. Construct each DC so that it can send high frequency health confirmation to a centralized aggregator (see the proposed format for these updates). Have per-data center dashboards the are hosted in the data center and allow both a redundant means to check DC health, as well as visualizations to facilitate root cause analysis. Have better tools to perform a realtime distributed search of server logs (the privilege to execute queries must remain available to only a small and trusted group of people, and we can continue to aggressively purge logs). 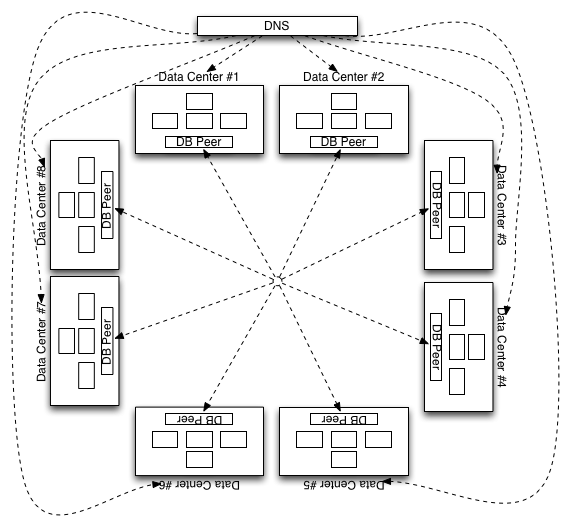 The purpose of this blog post is to help folks understand precisely the approach we're taking in scaling Persona to the ludicrously high availability that we must achieve for a system of this ambition. As always, we'll continue to report our progress in blogs, and on our mailing list. If you've got great experience tackling any of the problems that face us, I'd encourage you to chime in on our mailing list and contribute your advice!